Ellen DeGeneres hosted her second Academy Awards ceremony yesterday. Whether or not audiences will chalk her performance up as one of the greats (she certainly seemed a touch nervous at times, tripping over the odd word), it’s hard to argue that her general appeal is one of undiluted niceness and inoffensiveness. DeGeneres is the TV personality that walks her talk. She’s kind, cheerful and seems to treat everyone with respect and good humour. Her comedy is self-deprecating and never made at the expense of other people – even when she’s working a room filled with hundreds of the most overpaid and richly pampered people on the planet. Faced with the likes of Harvey Weinstein, Leonardo DiCaprio and Brad Pitt, she’s still charming. She might rib them, but she leaves the really cutting barbs to the likes of Ricky Gervais or Tina Fey and Amy Poehler (who can all pull that stuff off with aplomb). But still, even DeGeneres can manage to offend some of the people, some of the time. And this time she did it by using the ‘wrong’ phone. Recalling the Sochi scandal storm in a teacup around the claims that athletes were gifted Samsung Galaxy phones at the recent Winter Olympics, and directed to cover up the brand logo on any other phones used in the opening ceremony (i.e. their iPhones), DeGeneres is feeling some heat for not sticking with the sponsor’s toy throughout the Oscar ceremony. Samsung reportedly paid very big bikkies indeed to be one of the most prominent sponsors of Hollywood’s ‘Night of Nights’. Accordingly, when DeGeneres strolled up and down the aisles, chatting to celebrities and taking the odd selfie with the likes of Liza Minnelli (who she did accuse of being a drag queen at one point – maybe scratch that earlier point about her never being cruel to anyone…), it was a big old Samsung Galaxy Note she was using. And then there was the chaotic group shot in which Meryl Streep, Bradley Cooper, Julia Roberts, Brad Pitt, Kevin Spacey, Jennifer Lawrence, Angelina Jolie, Jared Leto, Channing Tatum, Lupita Nyong’o and her brother Peter pulled off the incredible feat of actually looking like a bunch of totally ordinary mates having a ball at a party. 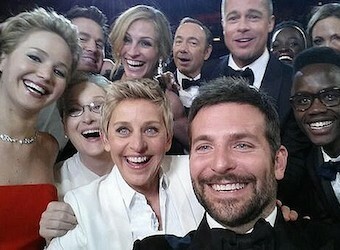 DeGeneres organised the pic, with the intent of breaking a record by getting the most retweeted pic in history (to date). It succeeded. Posted online by DeGeneres via her Twitter account @TheEllenShow, it has already notched up 2.4 million retweets and been favourited over 1.1 million times. “We crashed and broke Twitter. We made history,” chirped DeGeneres during the award ceremony’s broadcast. And it was done with a Samsung phone. But… apparently, backstage it was another story. With nearly half of her tweets sent out from her account coming from an iPhone. Look, DeGeneres made sure her sponsor-approved Samsung Galaxy figured prominently in a show that was broadcast to billions and was the instrument that took the selfie to end all selfies (not counting that scandalous heads of government shot that caused so much upset at Nelson Mandela’s memorial service), and became the very definition of going viral. It’s probably safe to say, Samsung got its money’s worth.